I have been out of town the last few days. Depending on my destination, I usually have a list of my favorite coffee places or seek advice from other coffee enthusiasts about where to find exceptional coffee or espresso. I knew this time, from previous trips, that finding excellent coffee was not a possibility. I can’t drink the bad stuff and can’t go without coffee, so I always travel with my coffee paraphernalia – grinder, whole beans, brushes, scoop, bottled water and a French Press. I always manage to forget my toothbrush though – no kidding! As it turned out this hotel was all about awesomely comfortable, luxurious rooms with no way to heat up water. Friday morning I headed out into the main area of the hotel looking for hot water. 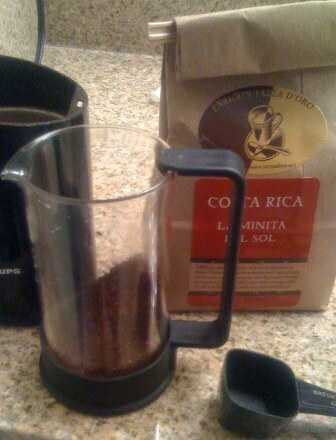 I find Leo, rad hotel attendant, he is feeling my lack of caffeine pain and is totally intrigued by my request for sufficiently hot water while walking around with a French Press of freshly ground Costa Rica La Minita. Leo takes me into a small utility room and there is was – a Bunn water tower with hot water (200F)! Leo watched every move and when the coffee was ready I shared my French Press with him. Leo suddenly left the room and said “don’t leave I will be right back”. 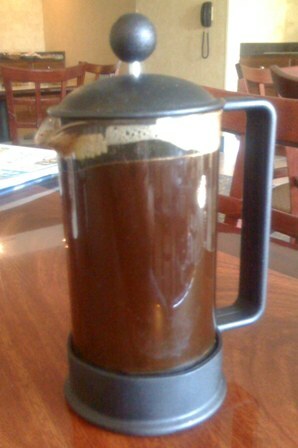 I ended up making about 5 or 6 French Presses that morning for the hotel staff and one of the owners. They thought it was the best cup of coffee they EVER tasted. Once again, coffee provided me with an awesome experience – sitting around the table with people from many parts of the world and country, tasting coffee and talking coffee and sharing small slices of life. I returned to the utility room the next morning to find my coffee stuff totally cleaned and ready to make more coffee. The manager of the hotel restaurant also provided me with an Italian ceramic cup to drink my coffee for the remainder of my stay! So, travel with your coffee stuff, have good coffee and cool experiences. It's so hard to get a good cup of nescafe these days! Good story. As someone that used to travel a LOT I know how bad hotel coffee can get... and it's always nice when you can open people's eyes to what coffee can be. Last time I went away I took a chemex, grinder, electric water kettle, and a temperature probe! I bought some distilled water, too... didn't want my coffee to taste like fish. Anyway, the probe was a little over the top but since I went through all the trouble of lugging the coffee stuff around I figured why not.